The weekend night market in Ayutthaya (also known as the Krungsri Market) is different from all other night markets we've experienced. The fantastic, beautiful lights lead you into the stalls brimming with all kinds of tasty Thai delicacies. Verdant parks and a river surround the market with lights flickering in the trees. 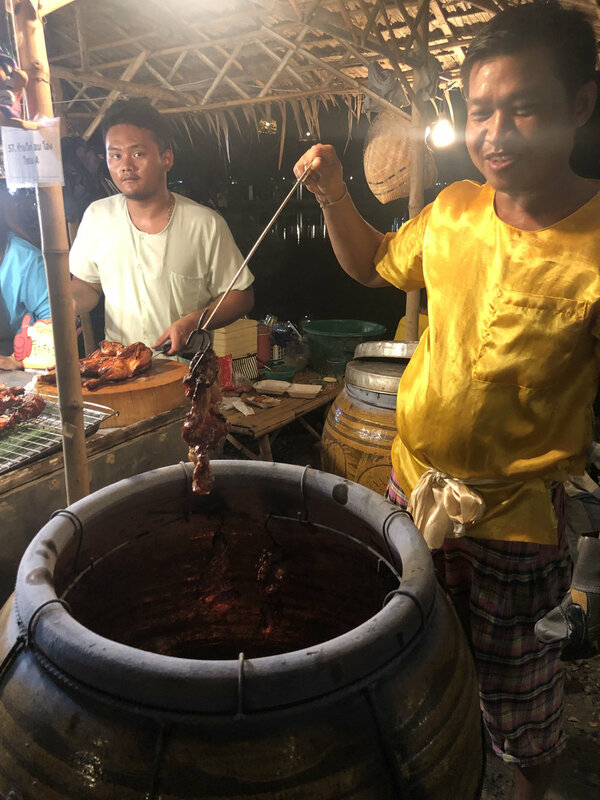 The booths and its vendors are dressed up in traditional Thai silk shirts and clothes, Thai instrumental music plays at every corner, and cooks use traditional methods to prepare meals. The Ayutthaya weekend market is a sensational gateway to Thai culture and cuisine experience you can't miss! Depending on where you are staying, the easiest way to get to the market will probably be tuk-tuk. There are not a lot of taxis in Ayutthaya, and it will only cost around 80 baht (~$1.67) to get there. Remember to agree on a price beforehand! Protip: If you are having trouble communicating with a taxi or tuk-tuk drivers, have someone working at your accommodation write down where you are going and where you are staying in Thai so you can get there and back with fewer issues. Read our Guide to Thailand for more pro tips! A big appetite and willingness to try new things. You will see so much food and have so many choices. Grab a few snacks as you walk from one end to the other, but wait to get your big entree till you see everything. We walked passed lobster for only 100 baht ($3.33), but I was stuffed. When you see large clay pots roasting meat, make sure stop at that booth and grab a sample. The flavor is incredible, and it is so tender that you barely need to chew. Think about slow-cooked meats, and this puts all of them to shame. Get a large squid straight off the grill and enjoy with a sweet and spicy sauce. These skewered treats are so flavorful and not as chewy as you'd think. Hot pot cooking is a local favorite! You receive a small clay pot with a delicious broth inside and hot coals underneath. Then, they give you a plate of veggies, herbs, noodles, and your choice of meat or seafood. It's like Thai sukiyaki where you cook your food, and it's a blast. If there are lots of locals at a particular stand, it's probably worth trying. So look out for those busy stands. Thai food is prepared quickly so don't worry about waiting long for your food if you're hungry. After indulging in all the food, take a look at the various clothing and gift booths sprinkled within the food stalls. We loved all the authentic Thai clothes but resisted getting anything since we have no more room in our packs. Night markets in Thailand can start to look and feel all the same, but this one is a gem. Ayutthaya's night bazaar is hands down the best overall market we've attended simply for the ambiance. If you want authentic Thai cuisine, music, art, clothing, and beautiful verdant scenery to top it off, you must attend Ayutthaya's famous weekend market! We are sure you won't regret it. We are night market addicts. Any other stellar night markets in Thailand we should try?